Ips is the Greek word for worms. Ipomoea, or worm-like, describes the twining growth bait of this genus. However, it has undergone many name changes in its history. Starting off as Pharbitis purpurea incarnate, then Convolvulus major, followed by Convolvulus pupurea, it was only in the 20th century that the Morning Glory earned its current name. Because the flowers open at night or in diffuse light and last only a single day, saluting the sun, the name is well-deserved — though quite a contrast to ‘worm-like’! Over 500-700 species of Ipomoea grow in widely differing habitats, in both temperate and tropical regions. Concolvulaceae range from members with trailing and twining stems to woody shrubs in semi-desert areas, to large shrubs and even trees upto 33 feet high in tropical and subtropical areas. Some species are found in salt marshes, covering sand dunes, in freshwater, on mountaintops, and one member, the Cuscuta, is a parasite on host plants. It is also a major weed problem in places such as New Mexico and Arizona. The heart-shaped leaves (deeply notched lobes in the seedling) are simple and alternate; the flowers are regular, bisexual and often with involucre of bracts. Its five petals and five stamens are fused to the base of the corolla tube to form a bold, showy trumpet which is visually arresting. The most important crop plant of the family is Ipomoea batatas (sweet potato). It is cultivated throughout tropical regions as a valuable food source, especially in times of famine. The plant has many local medicinal uses, particularly as a cathartic. Aztec priests in the tropical Americas used Ipomoea seeds in religious ceremonies. The seeds were ground and mixed with tobacco and insect ashes and the resulting paste was applied topically. This would numb the flesh and allow the priests to commune with spirits, fearlessly. The seeds were highly valued for their magical and medicinal secrets. In the 1960s the seeds were again in great demand as they were thought to contain lysergic acid derivativessimilar to the fungus ergot, and alleged to have hallucenogenic effects. 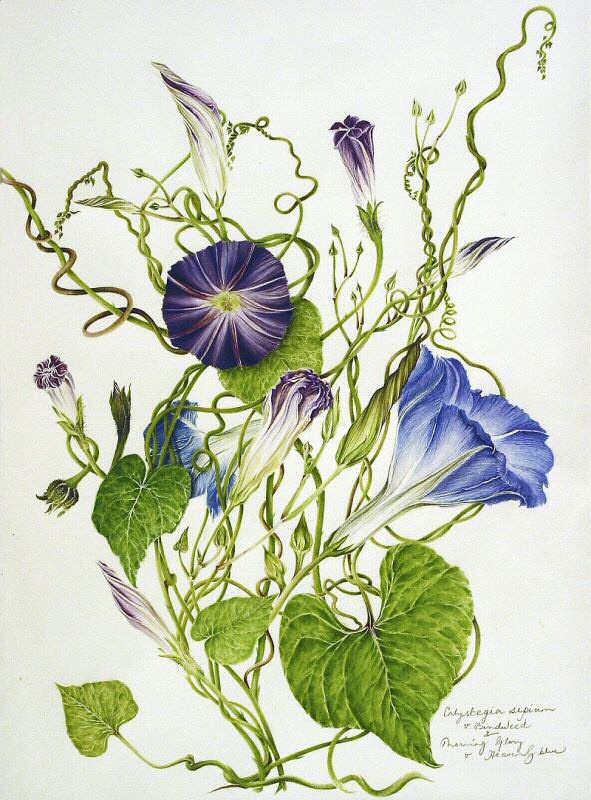 In the UK the sale of seeds was suspended in 1963 until investigations proved them harmless and Morning Glory seeds were available to gardeners who delight in their spectacular blooms. © 2007 – 2012, milly acharya. All rights reserved.